Every HR manager and C-suite executive knows it is tough to hold on to good employees. What’s more challenging is that when you do make mistakes, the best ones are the firsts to go, because they have the most options. In a survey by CEB, it was revealed that one-third of star employees are disengaged from their employer and are already looking for a new job. The key therefore to retaining your top employees is to keep them engaged. For us to better understand why top employees usually leave their employers, we’ve compiled responses from career experts. They are underutilized and unrecognized. According to Brett Baughman, business coach and CEO of The Brett Baughman Companies, Inc, employees are generally on the lookout for two crucial benefits. These two are ‘the ability to improve their position and income, and a positive environment that challenges them’. According to Baughman, it is important for managers to figure out what their employees are trying to work for in their lives and ‘align their roles’ to their life mission. For Terra Bohlmann of BrightBound, the primary reason why your best employees might quit is the failure to see them as valuable. She says the best employees quit when they feel ‘they are not being heard within the company’. Larry Boyer of Success Rockets LLC believes that the two major reasons top employees leave are ‘poor managers and lack of opportunity’. Boyer believes that poor managerial skills can be remedied. It simply requires ‘self-awareness or introspection’. Addressing the second one, lack of opportunity might be difficult. “There simply may be nowhere for a good employee to go in the organization. Good employees grow; their interests and needs change. That’s okay.”, Boyer said. According to a Bersin research, for the top 10% of employees, salary has a direct correlation to retention. Tara Padua of NextFem believes this is so because ‘their career mobility is much higher than their peers’. As a result, compensations serves as an important expression of how much the company values their contributions. In other words, compensation is a ‘yardstick for their impact’. They are given better offers elsewhere. This is probably the most commonsensical reason why top employees quit. In most cases, the incentives for accepting a better offer are extrinsic like salary increase or promotion. The satisfaction, however, from extrinsic incentives like salary increase is short-lived. Lianne Lyne of PLP Coaching, LLC advises managers to focus on intrinsic incentives instead. “Discover your best employees’ intrinsic motivations — like fun, personal development, autonomy, purpose — and enhance these to decrease their chance of burnout,” says Lyne. Your best employees quit because they can. They have more options. You can tell if your best employee is considering quitting. Indicators could be increased number of days off or decrease in the number of hours clocked. Barbara Safani of Career Solvers says it is important to motivate your best employees. Stimuli for motivation could be in the form of a training or stretch assignments among others. “If it’s money, examine if you are truly paying your A players competitively,” Safani says. “9 Things That Make Good Employees Quit”. 2017. Talentsmart. Accessed February 21 2017. http://www.talentsmart.com/articles/9-Things-That-Make-Good-Employees-Quit-172420765-p-1.html. “10 Critical Reasons Why People Quit Their Jobs”. 2017. The Balance. Accessed February 21 2017. https://www.thebalance.com/top-reasons-why-employees-quit-their-job-1918985. Floyd, Safon. 2016. “7 Reasons Why Your Best Employees Are Leaving”. Black Enterprise. Accessed February 21 2017. http://www.blackenterprise.com/small-business/best-employees-leaving-company/. “10 Reasons Why Your Best Employees Quit”. 2015. HR Daily Advisor. 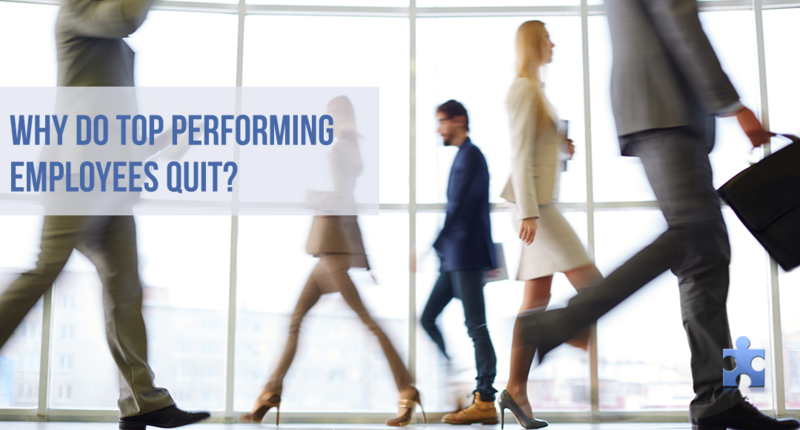 Accessed February 21 2017. http://hrdailyadvisor.blr.com/2015/08/14/10-reasons-why-your-best-employees-quit/. “Prevent Your Star Performers From Losing Passion For Their Work”. 2015. Harvard Business Review. Accessed February 21 2017. https://hbr.org/2015/01/prevent-your-star-performers-from-losing-passion-in-their-work.